According to the Chicago Sun Times, the Chicago Cubs are hosting a peanut allergy friendly game on April 14 which is already sold out. To have your contact information added to a list for future games, please call 1-800-THE-CUBS. Thanks to Kristen B (on Facebook) for letting us know about this game! There are 5 games with a peanut allergy friendly suite this year. Tickets are $65 to $75 each. They do include food and a beverage. For more info and to purchase tickets, please visit the Royals Peanut Allergy Friendly Games Page, listed above. It's Sunday June 3,only $19 per person and only 40 seats are available, so hurry! "People interested in purchasing tickets can call the South Bend Cubs at (574)-235-9988 or stop by the Box Office at Four Winds Field, located at 501 W. South Street." On https://www.mlb.com/tigers/tickets/specials/peanut-friendly, the Detroit Tigers provide information about this season's peanut allergy friendly games which are scheduled for April 21, April 22 and May 26.Tickets may also be purchase on that web page. A big thanks goes to the Tigers for making these games possible. 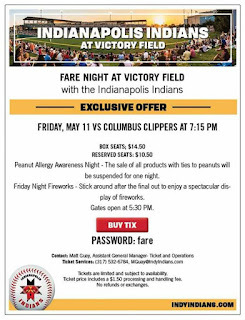 FAACT (Food Allergy & Anaphylaxis Connection Team) has partnered with the Cincinnati Reds to hold three (3) "peanut-sensitive" games this year: May 18, June 7, and August 15. All of the details are available on FAACT's website. There is a great deal of superb food allergy information on the FAACT website, including their poster about the signs and symptoms of anaphylaxis, so please be sure to take a look around their website and consider supporting them. To order tickets for one of the Reds' peanut-sensitive games, visit the Reds' website.